When war broke out against Mexico in May 1846, the United States Army numbered a mere 8,000, but soon 60,000 volunteers joined their ranks. The American Navy dominated the sea. The American government provided stable, capable leadership. The economy of the expanding United States far surpassed that of the fledgling Mexican state. Morale was on the American side. The war was a rout. Polk directed the war from Washington, D.C. He sent a 4-prong attack into the Mexican heartland. John Fremont and Stephen Kearny were sent to control the coveted lands of California and New Mexico. Fremont led a group of zealous Californians to declare independence even before word of hostilities reached the West. The "Bear Flag Republic" was not taken seriously, but Fremont and his followers did march to Monterey to capture the Mexican presidio, or fort. By 1847, California was secure. 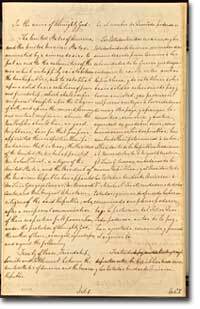 The original Treaty of Guadalupe Hidalgo was printed in two columns, the English translation on the left and the Spanish on the right. Meanwhile, Kearny led his troops into Santa Fe in August of 1846 causing the governor of New Mexico to flee. The city was captured without a single casualty. Soon he marched his army westward across the desert to join Fremont in California. The attack on Mexico proper was left to two other commanders. Zachary Taylor crossed the Rio Grande with his troops upon Polk's order. He fought Santa Anna's troops successfully on his advance toward the heart of Mexico. Winfield Scott delivered the knockout punch. 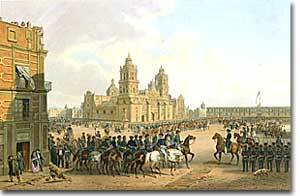 After invading Mexico at Vera Cruz, Scott's troops marched to the capital, Mexico City. All that remained was negotiating the terms of peace. Was the United States justified in taking half of Mexico's territory in the Treaty of Guadalupe Hidalgo? At home, the Whigs of the north complained bitterly about the war. Many questioned Polk's methods as misleading and unconstitutional. Abolitionists rightly feared that southerners would try to use newly acquired lands to expand slavery. Antiwar sentiment emerged in New England much as it had in the War of 1812. Writer Henry David Thoreau was sentenced to prison for refusing to pay the taxes he knew were used to fund the war effort. His essay, Civil Disobedience, became a standard of peaceful resistance for future activists. The Mexican-American War was formally concluded by the Treaty of Guadalupe-Hidalgo. The United States received the disputed Texan territory, as well as New Mexico territory and California. The Mexican government was paid $15 million — the same sum issued to France for the Louisiana Territory. The United States Army won a grand victory. Although suffering 13,000 killed, the military won every engagement of the war. Mexico was stripped of half of its territory and was not consoled by the monetary settlement. 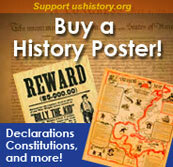 An outstanding site for just browsing or for conducting serious research on the Mexican-American War. Images, documents, maps, timelines, statistics, and much more is brought to you by the Descendants of Mexican War Veterans. Easy-to-navigate and beautifully illustrated. There is plenty of history on this website, but it is set apart from most by its dedication to differing viewpoints, living up to its opening argument that "many truths constitute the past." Navigation could be better, so use the site map for a listing of all the provocative articles. This outstanding timeline from PBS and KERA TV follows events from both Mexican and American perspectives. A third section reveals national and international happenings. Rich illustrations add to the enjoyment.